Around The Corner Dental Health Spa is giving new patients the chance to garner a complimentary session with him on all matters related to their oral health. Dr. Kanani, a popular general dentist Woodland Hills, has recently announced that he will be offering complimentary consultations plus a $26.99 ex-ray for first time patients. In an effort to encourage more people to pay attention to their oral health, Dr. Kanani has taken it upon himself and his clinic to offer this public service. According to this dentist in Woodland Hills, it is not right to deny people the right to good dental care simply because they are unable to afford it. In Dr. Kanani’s eyes, everyone should have access to the necessary dental procedures. More often than not, patients who are unable to afford proper dental care are the ones who need it the most. Simple procedures such as filling a cavity, getting veneers, teeth scaling and whitening, and even dealing with tooth loss pose as a problem for them. Dr. Kanani has graciously extended a helping hand to those looking for good dental care. Here are some of the procedures that Dr. Kanani offers at his dental clinic. This procedure is mainly reserved for those who suffer from tooth loss. Dr. Kanani is pleased to inform all his patients that he has revolutionized the way this procedure is carried out. For one, Dr. Kanani’s procedure is known as the Flap-Less/Drill-Less Surgery method. 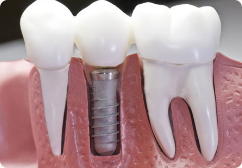 Using a series of dental instruments, this popular Woodland Hills dentist expands the patient’s jawbone, creating a space where the titanium dental implant is inserted into. This is then left to heal. In several months, the patient is requested to return to complete the final phase of the procedure. This is when the mock tooth is placed over the dental implant, giving the patient a full set of teeth. As opposed to other conventional methods, Dr. Kanani’s method of performing dental implants is less invasive and thus, demands for a much shorter recovery time. Additionally thanks to this dentist in Woodland Hills, this method has brought down the overall dental implants cost by $4,000. This simple procedure is usually completed in one session and is one of the most common procedures carried out by this top family dentist in Woodland Hills. Accordingly to Dr. Kanani, fillings are done to remove tooth decay and to replace the affected tooth structure. When caught at an early stage, cavities can be combated quickly and painlessly. Problems only arise when patients wait too long to seek dental help and a root canal treatment or tooth extraction has to be carried out. Tooth loss may lead to the eventuality of patients seeking dental implants. As dental implants cost a lot, it is advisable that patients get their cavity fillings taken care of as soon as possible and not wait too long. Patients can also opt to replace their older amalgam fillings with metal-free modern composite fillings. For more information on Dr. Kanani and general dentistry Woodland Hills by calling (818) 962-1141 or visiting woodlandhillsdentalspa (dot) com. Do not forget to ask about the complimentary consultations currently being offered to first time patients.